Friant — French Tier III cruiser. A light cruiser project designed after the end of World War I that revealed an acute shortage of this type of ship in the French Navy. The primary features of the project were high speed, weak armor, powerful torpedo armament and main guns placed in turrets. Tier III's Friant is a ship of extremes. Her 30 knot top speed places her amongst the fastest cruisers at Tier III (though she is less maneuverable), while her 23mm of maximum armor protection make her the least-armored cruiser at her tier. Friant is exceedingly fragile, but her armaments give her a lot of flexibility that most of her Tier III counterparts can't match. For starters, her HE shells have solid performance; they are more than capable of punishing destroyers that get too close, while her torpedoes make a lovely surprise for battleships and cruisers who think she will be an easy kill. She must be carefully angled in order to get the best performance out of her armor, as she takes a lot of damage from shell penetrations. A major advantage for Friant is the all-centreline arrangement of her main battery, which allows her to bring all of her guns to bear on a single target---a feature some cruiser lines don't acquire until three tiers later. Unfortunately, her slower reload means that she cannot put out the same number of shells as ships like Kolberg or St. Louis, so Friant captains must make every shot count. And, while her gun range is better than average for her tier, her low muzzle velocity and high dispersion are challenging at-range. Additionally, captains may want to take Expert Marksman to make up for slower turret traverse. Beyond Damage Control Party, she has no additional consumables. Torpedoes with decent range and excellent firing arcs. All-centreline AB-XY turret layout is excellent for its tier. Takes heavy damage from hits. The hull upgrade should be researched first. The additional hit points and faster rudder shift will make the ship more comfortable to play. The addition of secondary and anti-aircraft weaponry is marginal. After the hull, either research the Gun Fire Control System to add 10% to her gun range, or save the experience in order to unlock Duguay-Trouin faster. Friant is best set up to function as a long-range support cruiser. She will want to fire at medium and long range until the battle is nearly decided; then she can close in and use her torpedoes for maximum effect. Captains are recommended to stick close to their heavy hitting battleships and ward off any destroyers that attempt to kill them. For Upgrade Slot 1, Main Armaments Modification 1 ( ) is recommended; it will keep Friant’s guns and torpedoes firing. In Upgrade Slot 2, either take Damage Control System Modification 1 ( ) for reduced fire/flood chance, or Steering Gears Modification 1 ( ) to ensure your rudder survives so you can continue to angle against incoming fire. 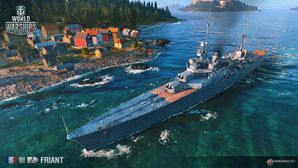 Like most long-range cruisers, Friant will benefit most from skills that help the ship survive and also punish enemies who push too close to her. The premium Damage Control Party is recommended to help ensure the ship's vital systems are running at maximum efficiency. The original Friant was a protected cruiser from 1895. However, this version reflects the French Project 171 from 1919, which was a part of designs leading up to Duguay-Trouin. The 75 mm and 90 mm anti-aircraft guns were developed in 1922 and 1926 respectively. This page was last modified on 10 March 2019, at 15:13. This page has been accessed 24,681 times.